Here is the list of best free Cursor Maker Software for Windows. These cursor maker software let you create cursors of any custom shape. You can import images in various image formats and make them your cursor using these cursor maker freeware. Some of these software can be used to create both icons and cursors. With the help of these free cursor creators, you can make both animated and custom cursors. Working principles of all these software are almost same. You can make a cursor either by free-hand drawing tools or by importing any image into the software. That’s all. For animated cursors, you can set either same frame rate for all frames or different frame rates for each frame. If you want to add some text to an image of a cursor, that option is also available in these software. One of these software lets you extract image from icon of .exe files, so that you can make that your cursor. For example, you can make the icon of Google Chrome your cursor. Greenfish Icon Editor Pro: By using this software, you can create both animated and static cursors without any hassle. For editing fine details of an image of a cursor, pixel size from 16 x 16 to 1024 x 1024 is given in the software. Moreover, you can also create custom pixel size for making a cursor. You can also add multiple frames for creating animated cursor easily. The time duration for each frame can be set separately in milliseconds. One of the interesting features of the software is that you can create multiple cursors at a time and it opens each new graphic in a separate window, so that you can switch to any of them easily while editing. A number of filters are given in the software which you can use to make your cursor more attractive. Some of these filters are Greyscale, Invert, Solarise, Soft Blur, Custom Blur, Sharpen, etc. You can also import and export an image in multiple formats. Some of these formats are .cur, .ico, JPEG, GIF, PNG, BMP, etc. Customizing the hotspot of cursor in Greenfish Icon Editor Pro is very easy. To customize a hotspot of your cursor, first select Hotspot tool, then click that point in the image which you want to make hotspot. Go through the list and download these free cursor maker software and explore your creativity. Create cursors of any shape and colors and surprise your friends. You will also get to know, how to create cursor using these freeware. You can also checkout the list of best free Free Software To Organize Desktop Icons, Websites To Download Free Material Design Icons, and Free Software To Control Mouse With Keyboard. Meet Greenfish Icon Editor Pro, a free Cursor Maker software for Windows. The software comes with a lot of features which let you create cursors of any custom shape. Use this software to create both static as well as animated cursors for your desktop. A lot of tools are available in the software. You can add multiple layers to make an animated cursor and set different frame rates for each layer. Moreover, import and export options are also available in the software. This means you can import any image into the software to create a cursor. A number of file formats are supported by this software. Some of these are Cursor files, Icon files, JPEG files, GIF files, PNG files, BMP files, and many more. A number of tools are available in the software which can be used to make custom cursor, such as: Rectangular Select Tool, Elliptical Select Tool, Pencil Select tool, Eyedropper, Line Tool, and Pencil Tool. You can set different frame rates for each frame of animated cursor. You can create multiple cursors at a time. It opens each new graphic in a separate window so that you can switch to any of them easily while editing. If you want to write something on a cursor, Text tool is provided for that purpose. An interesting feature of the software is that it comes with 8 different types of textures. You can give an attractive look to your cursor using these textures. Add filters to your cursor in order to make it more attractive. Some of the effects available in the software are Greyscale, Invert, Solarise, Soft Blur, Custom Blur, Sharpen, etc. It can import and export an image in multiple formats. Some of these formats are .Cur, .ico, JPEG, GIF, PNG, BMP, etc. You can export single or multiple pages/images in just a single click. All in all, this is one of the best cursor making software for Windows. Real World Cursor Editor is a free Cursor Maker software for Windows which lets you design your own cursors. Various customizing options are available in the software; you can use any of them. You can create animated fire, animated spinning wheel, animated clock, or more as a cursor. To create an animated cursor, you have to add more than one frame. In each frame, a separate frame rate can be set. To create a custom cursor, select ‘New Mouse Cursor’ from Create option in the software. After selecting this option, a new window opens in front of you, where you can create a new mouse cursor. Here, you will find a number of tools available in the toolbar. Use various line tools to draw cursors of different shapes. Moreover, drawing tools are also available in the software. These include Pencil, Brush, and Lasso tools. These drawing tools let you create a cursor of any shape and color. Import and export options are available in the software. You can also create a cursor with your own name with the help of text tool in this cursor maker. To create an animated image cursor, select ‘Cursor from Image’ in Create Option in the software, or simply open an image in the software. You can add multiple animated images and set different frame rates for each image. To add multiple images, select insert frame option in Cursor tool. After setting different frame rates for each image, you will see that each image will change according to their frame rates. After you are done, save your design as an animated cursor file and make it your default cursor from Control Panel. It lets you create your own cursors with different shapes and colors. You can also create cursors of your name and add multiple effects to them. A number of selection tools are available in the software like Brush selection, Lasso selection, Ellipse selection, Rectangular selection, and more. You can create animated cursors and give them special effects. You can flip your image in both horizontal or vertical directions. Create animated fire, animated spinning wheel, animated clock, and more with this free cursor maker software. Iconoplasm is another cursor maker software for Windows which lets you edit or create cursors. All tools that are necessary to design a cursor are available in the software. It offers a user-friendly interface, so that you will not find any difficulty in designing a cursor. You can add different colors to your cursor, vary its brightness and contrast, flip it in both horizontal and vertical directions, rotate it at any custom angle, and do a lot more. Add different types of fill patterns to your cursor and make it attractive. A color palette is also provided just below the toolbar. You can select any color from color palette. A number of editing tools are available in the toolbar of the software. Some of these are Undo, Select, Text, Fill, Draw, Line, Move Pixel, etc. To preview your animated cursor, just click the Play button present in the toolbar. You can even select whether to show or hide this Play button simply by clicking Enable option in Animation menu. Draw: You can use this tool to create any free hand drawing. Line: Draws a straight line. Box tool: Draws a shape of a box. Two types of box tools are available in the software, namely, Box and Filled Box. Ellipse: As is clear from its name, it is used to draw the shape of an ellipse. You can also draw a circle using this tool. Two types of ellipse tools are available in the software, namely, Ellipse and Filled Ellipse. Play: A type of preview button that is used to play an animation. You can show or hide it in Animation menu. Undo: Takes you one step back. Select: Use this tool to select a particular area. Flood Fill: A type of coloring tool which is used to fill color in an enclosed area with just a single click. Block Fill (4 x 4): This tool draws a filled box of dimensions 4 x 4. Move Pixel: With the help of this tool, you can move each pixel of an image separately. It offers a user-friendly interface. A number of transformations are available in the software. Some of these are Flip, Rotate, Explode, Superimpose image, Invert, 3D Shadow, etc. A lot of Fill Patterns are also available in the software. Some of these are Chequered, Small Blocks, Castles, Balloons, Vertical Line, Cross, Diagonal Cross, etc. You can show or hide Grid lines in the software. With the help of Move Pixel tool, you can move each pixel of an image separately. Print option is available in the software. This means you can also save an image as a PDF. You can add the current image as a colored or monochrome filled pattern. Setting a Hotspot for a cursor is a little bit difficult. I have not found any Frame Rate Setting option for animated cursors. It automatically makes multiple copies of a frame on enabling Animation. If you are creating an animated cursor with multiple frames, you can only insert images in .ico and .cur formats. You can add multiple frames only after enabling Animation. AniFX is another Cursor Maker Software for Windows which lets you create your own cursors. You can do a lot of things with your cursor with the help of this free cursor maker software. You can create both static as well as animated cursors using this software. You can also fill different colors in cursors. It works with most of the popular file formats like CUR, ICO, ANI, BMP, PNG, JPG, GIF, EXE, OCX, and more. You can change the hotspot of the cursor that you have created using this software. A number of drawing tools are available in the software which you can use for creating cursors of different shape and color. Some of the tools include spray, brush, pencil, insert lines, rectangles, ellipses, etc. You can add special effects to your project. A wide range of special effects are available in the software like Greyscale, Emboss, Sharpen, Invert Colors, Pale, Paint Dark, Paint Bright, etc. You can also apply shadow, change the level of brightness and contrast, alter the saturation level, and do much more with your cursor. Different frame rates per second can be set for different images. Cursor Test option is provided in the software so that you can preview a created cursor. You can add 32 bits, 24 bits, 8 bits, 4 bits, and 1 bit images at a time to create cursor. All in all, AniFX is one of the best tools for creating user-defined cursors. Animated Cursor Maker is a simple to use free cursor maker software for Windows. It offers an simple user interface that makes it easy to use and understand. Anyone can create animated cursors easily using this free animated cursor creator software. In order to create your own cursor, just load the images from which you want to create animated cursor. After that, set the frame rate for each image by clicking ‘Change Delay’ option in the software. You can preview your cursor in the preview window of the software. When you are done, save your project and make it your default cursor by changing mouse settings in the Control Panel. 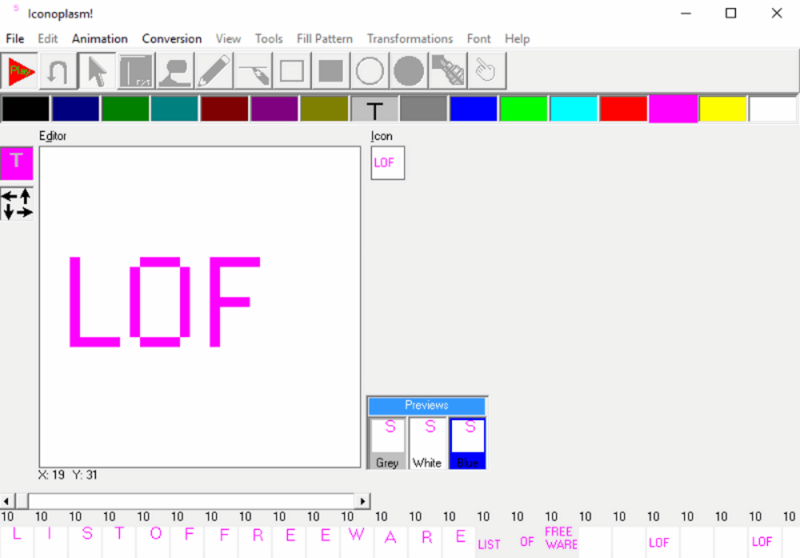 IconArt is another free Cursor Maker Software for Windows that lets you create cursors on your own. You can insert more than one frame to make an animated cursor and set a different delay time for each frame. Import option is also available in the software, so that you can create animated cursor. Only BMP, JPG, JPEG, and GIF image formats are acceptable by the software. This free Cursor Maker software comes with 10 different types of tools to create cursor, such as: Pen, Line, Box, Filled Box, Fill Color, Spray, Select Tool, etc. Each of these tools is labeled from 0 to 9. You can select any tool simply by pressing a particular numeric key on the keyboard. You can save your designed image as an icon, cursor, or an animated cursor. Moreover, you can easily set a hotspot for a cursor using this software. After completion, you can preview your cursor simply by clicking the Play button in the software. A number of themes are available, which you can select to change how this software looks. 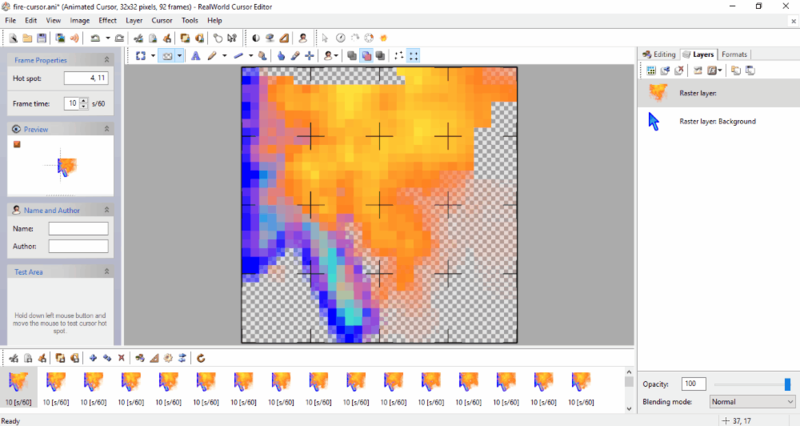 Awiconslite is another free cursor creator in our list of best free cursor maker software for Windows. You can use this software for creating both icons and animated cursors. 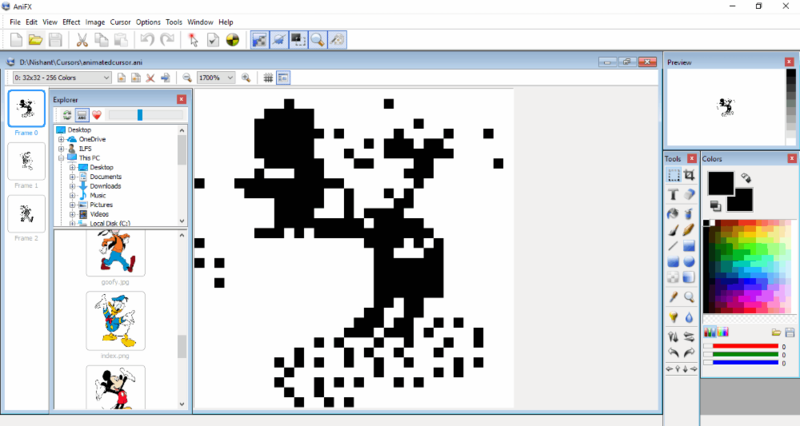 You can create a cursor of any shape using the tools available in the software. Some of these tools are Pen, Line, Filled Rectangle, Hollow Rectangle, Blur Fill, Text, Color Picker, etc. Different keyboard shortcuts are defined for each tool in the software; you can use the tools directly by pressing their respective hotkeys on your keyboard. You can add multiple layers to create an animated cursor. Add different effects, vary brightness, contrast etc., and do much more to your cursor. If you want to import an image to create an animated cursor, that option is also available in the software. After creating a cursor, you can set its hotspot as per your convenience. You can change the size of your cursor anytime while editing. The size of a brush can be varied easily with the help of a slider. Undo and Redo options are available in the software. You can rotate cursor to any custom angle. You can also select whether to show or hide grid lines while designing. You can import any image into the software for making a cursor. It supports many image formats. Some of them are GIF, PNG, JPG, BMP, etc. It supports more than 20 languages. After completion, you can preview your animated cursor by clicking Object menu. Snapshot feature is available in the software but it didn’t work properly while I was testing the software. That is the only disadvantage that I had found during testing. If you are looking for a simple and easy to use cursor maker software for Windows, try Icon Edit. You can use this software for making icons as well as cursors. It offers a simple user-interface. All tools necessary for creating cursor are available in the software at left side. Some of these tools are Line, Freehand, Erase, Filled Circle, Empty Circle, Selection tool, Hotspot, Invert Colors, etc. You can easily rotate an image in both clockwise and anticlockwise directions. You can also flip it in both horizontal and vertical directions. This cursor maker freeware comes with an advanced feature – Mouse Functions. This advanced feature lets you use all three buttons of your mouse to create a cursor. You can define different functions and different colors for the Left, Right, and Middle click of a mouse. Once done with designing your cursor, you can save it as .cur file. All three clicks of a mouse can be defined with different functions for creating a cursor. You can export the designed cursor in BMP format for preview. You can import an image of any size into the software to create a cursor. It supports most of the popular image formats like BMP, JPG, JPEG, GIF, etc. You can create multiple cursors and icons at a time. It opens each image in a new window so that you can easily switch between them. It does not support PNG format. You cannot create animated cursors using this software. You can only create static cursors. JustCursors is a simple to use free cursor maker software for Windows. You can use this software for making both animated and static cursors. You can create different shapes of cursors and paint them with multiple colors easily. It contains 10 different types of tools that you can use to create a cursor. Some of these tools are Pen, Line, Solid Rectangle, Solid Ellipse, Fill tool, Color Selection tool, Hotspot Selection tool, etc. The size of Pen tool can be varied from 0 to 7. Animated Cursors can be created easily using this free cursor maker software. Start with setting the number of frames. After that, start creating freehand drawings in each frame. At last, add delay time for each frame. That’s all. You can set the same frame rate for all frames or different frame rates for each frame. You can also change the sequence of frames in the software. You can fill different colors in cursors. You can set the hotspot of a cursor as per your convenience. Export and import options are unavailable in the software. Undo option will erase the whole design you have created. If you are looking for a free cursor maker software for your kids, download Anicursor. This cursor making software is developed in a way that children can also create cursors using it. Though it comes with only a limited number of tools, it is a good choice for making cursors. You can make cursors of any custom shape and colors with the help of Pencil tool. You can use brush tool for coloring purpose. Moreover, a line tool can be used to draw straight lines. A lot of colors are available in the color palette of the software. Paint bucket tool is also available in the software but it didn’t work while I was testing the software. You can easily set a Hotspot for your cursor in the software. You can create both cursor and icon using this software. Import and export options are unavailable in the software. The size of the brush can be varied easily. You can save any color in Palette file format. You can also load any color into the software in the same file format. You can create only static cursors using this free software. There is no option to create an animated cursor in the software. You can undo only a single step. Limited tools are present in the software for creating cursor. Icon Maker is a very basic tool for converting an image into a cursor. As it is clear from its name, it is an icon maker software but you can also use it for creating cursors. The working principle of this software is simple. You have to import an image into the software and it will convert it in .ico or .cur formats. Zooming tool is also available in the software so that you can design cursor perfectly. The Rectangular select tool provided here lets you select a part of an image to turn it into an icon or cursor. It supports all popular image formats like JPG, PNG, TIFF, BMP, etc. Do note that this is a very basic software that only lets you convert an image into static cursor or an icon. You neither can create a cursor of any custom shape, nor create an animated cursor.